With the divine grace of God and the blessings of the Guru, Global Organization for Divinity (GOD) presents the Annual Spiritual Discourse Series for 2011-12. 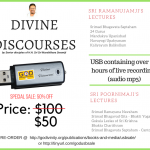 Similar to earlier years, this is a grand series of discourses and lectures on various topics glorifying the Sanatana Dharma, Nama Kirtan and Bhagavata Dharma. 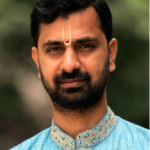 The aim of this is to spread the greatness of our Sanatana Dharma to the Indians living abroad, as well as to our American friends belonging to other countries and races. 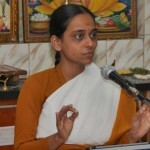 Shri Poornimaji, a senior disciple of HH Sri Sri Muralidhara Swamiji, who is touring the US between December 2011 and April 2012 conducted, in addition to spiritual discourses, a variety of youth educational programs, which includes personality development and enablement lectures in schools and colleges, mainly catering to children and young adults across different parts of the country.